This superb oil on panel painting is by British Victorian artist William Henry Crome, son of artist John Crome, founder of the Norwich School. 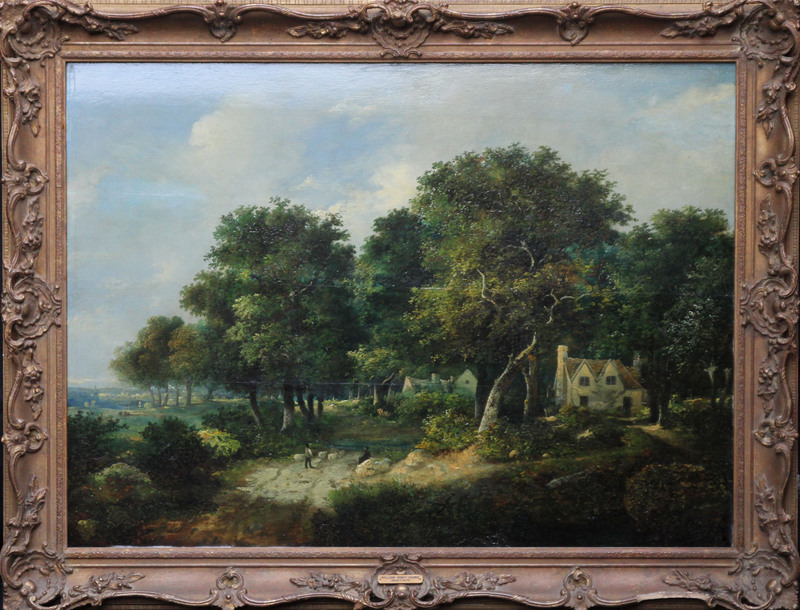 Painted circa 1850 the painting depicts a wooded landscape with a shepherd driving sheep along a lane past cottages. A town can be seen in the background. It is a sunny day and sunlight picks out the shepherd and his sheep as they pause to converse with another figure. The sunlight also lights up the nearby cottage giving it a lovely glow and one can see there is great detail in the trees. A beautiful old painting by a British Old Master. Housed in a gallery frame 37 inches by 31 inches and in excellent condition. William Henry Crome was born in Norwich on 22nd October 1806. He was the 3rd son of John Crome, one of the founders of the Norwich school. William Henry was very unfortunate in losing his father at the early age of fifteen. Whilst John Berney, his older brother, had sheltered under his father’s wing, William had to make his own way, and this he commenced to do with good effect. Father John Crome died in 1821. William would have assisted his father in the studio at the age of 15 and was probably becoming quite competent. John Berney probably carried on the tuition and many of William’s early works were moonlights and one can decidedly see the influence of his elder brother. In 1826 William Henry was sufficiently competent to exhibit a painting entitled A View at Costessey, Norfolk, at the British institution. The acceptance of the exhibit must have spurred him on. William Married Mary Ann Steel, it is not known how many children they had but at least one son, Vivian painted. At the Age of 24 William was beginning to look towards one of the Old Masters – Claude Lorraine, for influence. This influence can be identified in many of his Scottish scenes painted around 1830. 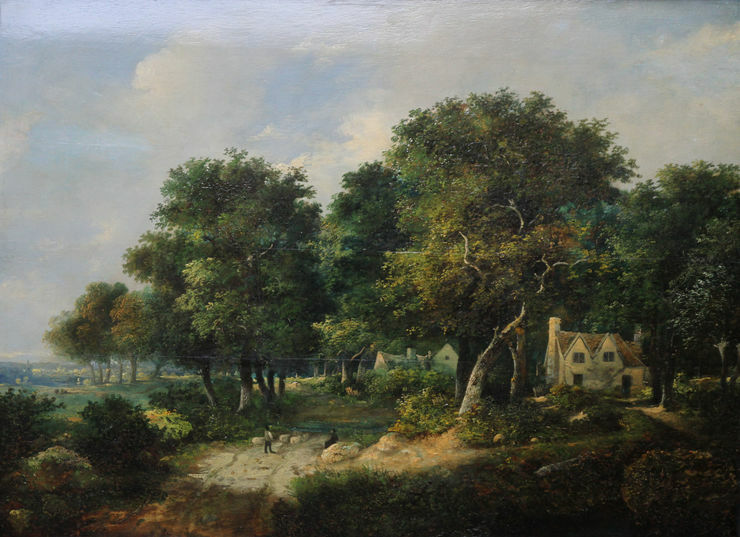 William travelled to the continent, his visit is recorded by an inscription on a painting, it reads: Near Aix La Chappelle, Brussels 1854. There are other paintings signed and dated 1866. William Henry Crome died in 1873.